The number of active advertisers on Facebook now exceeds 2 million—a 33% increase since July 2014. According to the company, small and medium businesses make up the majority of that group, proving the platform has become a mainstream advertising channel for more than just big brands. As the importance of Facebook advertising grows, business of all shapes and sizes are wanting more than one way to sell a product. Enter: Facebook product ads. This helpful new feature more or less translates a brand’s product catalog into an interactive, social-friendly ad. So how can you be sure that the right products are reaching the right people? Used strategically and creatively, product ads can lead to increased website clicks and conversions. Here’s everything you need to know to make an impact. If your product catalog is compact, or you don’t have one at all, consider using multi-product ads. Introduced in June 2014, multi-product ads enable businesses to feature more products in the Facebook News Feed without having to create multiple ads. The carousel supports up to five products, each with its own image, description and link. Similar to link ads, multi-product ads are good for increasing clicks and conversions. By highlighting more than one product or promotion, you give people more reasons to click. And because each image has a unique URL, you can drive more traffic to different pages on your site. “The ability to control product order placement offered gifting inspiration for our current customers and created a natural introduction of products for our new customers, resulting in a 20%+ increase in click through rate,” Shutterfly Chief Marketing Office John Boris is quoted as saying on Facebook’s website. You also will find that having more images and links in a single ad opens up opportunities to talk about your business in new ways and achieve different objectives. For example, instead of promoting several products, you could showcase different product features or benefits. Multi-product ads can also be used for remarketing purposes. For instance, you could create a Custom Audience of people who have visited a product page on your website and then show them a Facebook Ad that features the same product. Facebook product ads resulted in a 20%+ increase CTR for Shutterfly.com. Currently, multi-product ads can only be created within Power Editor, the Facebook Ads API, or if you’re working with a Facebook Marketing Partner. Note: Don’t be confused by the option to create multiple ads in your ad dashboard. Go to Power Editor, and create a new campaign. Note: Multi-product ads are only supported in the Clicks to Website or Website Conversions objectives available in the drop-down menu. In the Create Ad section, select Multiple Images and Links in One Ad. By default, the single option is selected. Enter the text that will appear above your group of ads that clearly tells people what you’re promoting. Choose the number of images and links. By default, it starts at three, but you can click + to add up to five. Click on each numbered box, and enter the Destination URL, Headline, Description and Image to upload. Recommended image size is 600 x 600 pixels. If you don’t enter anything under Headline or Description, Facebook will pull that information from your Page’s metadata. Under See More URL, enter the Destination URL for the final panel in your ad. If you’re using a long, complex URL, you can enter a shorter, more user-friendly version in the See More Display URL box. Decide whether you want to select the order of your images or if you’d rather have Facebook optimize the order for best results. The latter is selected by default. If left unchecked, your panels will display in the order that you entered them. If checked, Facebook will order them based on the level of engagement they receive. 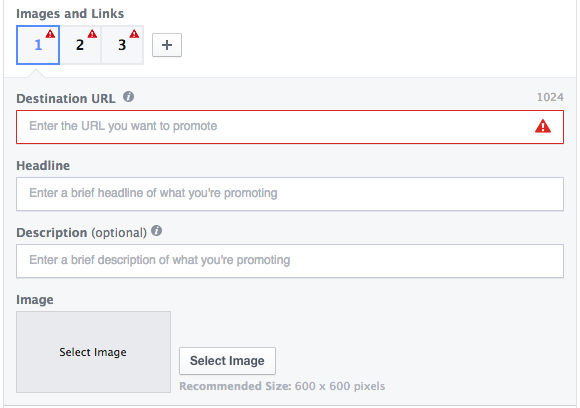 (Optional) Add URL Tags will help track and measure clicks on a link, and Tracking Pixels will tell you which ads led to a conversion. Click Upload Changes to save. As you can see, Home Chef used different images for each of its five panels, all linking to the brand’s homepage. If you want to take things a step further, you can pair unique URLs with each image in order to drive and measure traffic to different parts of your website. Images should be 600 x 600 pixels, with a 1:1 ratio, and should follow the 20% rule. Text is limited to 90 characters. Headline is limited to 25 characters. Link description is limited to 30 characters. 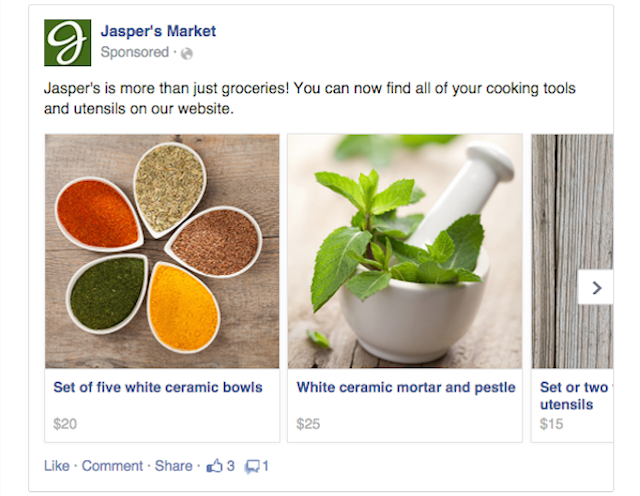 Facebook’s dynamic product ads are perfect for retailers and ecommerce businesses with large product catalogs. 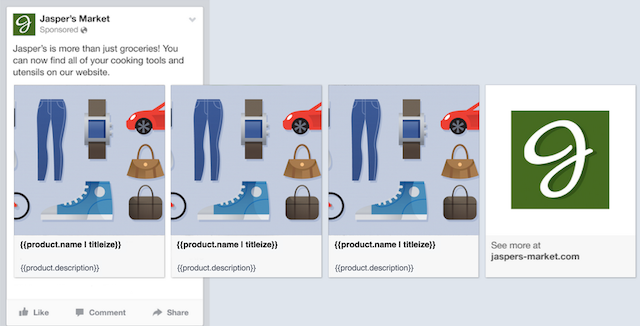 Rather than creating an ad for each product, Facebook creates the ads for you and personalizes them for your shoppers so you don’t have to spend time configuring your creative for each one. Your website visitors will be eligible to see dynamic product ads specially formatted for them, based on the products they browse. For example, if someone views a bicycle on your site, that person might see a product ad for bikes or a selection of related products the next time they visit Facebook. Once created, your product ads will continually reach people with the right product at the right time on any device they use. With placement in Facebook’s mobile News Feed—which wasn’t possible in earlier iterations—this updated version is much more mobile-friendly. Your ads will only display products that are in stock and at the latest price. When a purchase is made on your site, product ads automatically turn off so shoppers only see what’s currently available. Upload your existing product catalog to Business Manager. Business Manager is a tool that lets you manage all of the people, ad accounts and Pages that you work with in one place. This is best set up by the primary admin for your Page. Your product catalog is a list of products you want to advertise and their attributes, such as product ID, name, description, landing page URL, image URL, availability and so on. Add a Custom Audience pixel to your website, and modify it so that it reports when product IDs from your catalog are being viewed, added to cart and purchased. This is the same pixel used to create website Custom Audiences and can be found in your ad account under the Audiences tab. There are some important specifications to keep in mind when uploading your product catalog. Facebook supports XML and tab-delimited .CSV, .TXT or .TSV files as well as compressed .ZIP, .BZ2 and .GZ files. The maximum file size for uploads is 2GB. If you manually upload your catalog—as opposed to linking it—you’ll need to re-upload the file if there are any changes. Once these items are in place, you’ll be able to access dynamic product ads in Power Editor. Currently, dynamic product ads can only be created in Power Editor, through the Facebook API or with the help of select Facebook Marketing Partners. Go to Power Editor and create a new campaign. You must select the Product Sales Catalog objective. Create a new campaign and select the Product Sales Catalog objective. On the Ad Sets tab, add a new ad set and choose the campaign you just created. Under Products, click + and select the product catalog you want to use. You can choose to advertise your entire product catalog or use the filters to focus on a portion of it. Set a budget and scheduling preferences. Choose the audience behavior you want to target. You can choose people who viewed the product but didn’t buy it, added the product to their cart but didn’t buy it, or both. (Optional) Add more targeting. Keep in mind that the ads will only run to people who’ve already been to your website and interacted with a specific product. The audience for your ad will be narrow and additional targeting might reduce its reach. Set additional optimization or delivery options for the ad. In the Ads tab, create a new ad and choose the campaign and ad set you just created. Under Ad Template Options, choose whether to show a single image in your ad or multiple images. Edit any of the template text for your ad. As you’re building your product ad, use Custom Audiences to reach more relevant groups of people. Through a new feature, you’re able to build audiences based on parameters, such as people who haven’t visited your website in a while or people who have visited certain pages of your site. New audience limits also enable you to build highly targeted segments for different products in your catalog. Retailers using dynamic product ads are seeing great early results. According to Facebook Marketing Partner StitcherAds, some of its ecommerce retailers saw up to 24 times the return on ad spend. The early results have exceeded expectations for Target, which saw a 20% increase in conversions compared to other Facebook Ads. Success isn’t limited to advertisers within the US either. The European retailer Made.com saw a 160% return on ad spend using dynamic product ads compared to previous retargeting campaigns.